The 2018-19 NHL preseason is over, and for the Ottawa Senators, it ended with a few surprises on the final roster. The club lost its first four games but came back strong in the final two, defeating the talent-heavy Chicago Blackhawks and shutting out the Montreal Canadiens. Assumptions and questions surrounded the club leading into the preseason, with the Senators beginning their rebuild. Can 2018 fourth overall pick Brady Tkachuk crack the lineup? How will the team balance rookies and veterans? Which rookies will make the team? The lineup has taken shape and while it’s likely to change often with the rebuild underway, here are the three biggest surprises as the regular season gets underway. Bobby Ryan has become the poster boy for misery in Ottawa. Acquired in the trade that sent Jakob Silfverberg and a first-round pick to the Anaheim Ducks, Ryan has never really lived up to the hype he had from his time in California. He’s also spent a large chunk of time nursing the exact same hand injury over the last few years. But heading into the regular season, Ryan is on the top line with Matt Duchene and Ryan Dzingel. 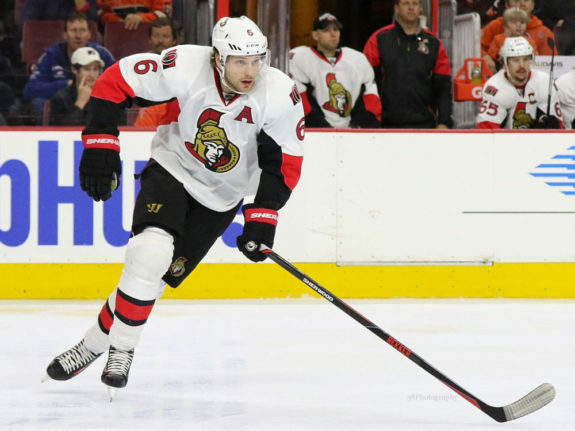 Could this be the year that Sens fans get the Bobby Ryan that everyone hoped for? Ryan had a solid preseason, but it’s hard not to overlook another reason that he’s on the top line. Mark Stone and rookie Brady Tkachuk have found some great chemistry together, and you can’t have all the team’s offence on one line. Duchene, the other main offensive weapon on the team, is a number-one centre, so Stone and Tkachuk went to the second line. Ryan is at least better than the third line after this preseason, so he therefore ends up on the top line with Duchene. It’s surprising to see him up there, but the chemistry between Stone and Tkachuk can’t be ignored, and Stone will be a great mentor to the 2018 fourth overall pick. This move gives the Senators a solid top two lines. Ryan was rumoured to be on the trade block all summer, including a possible trade to the Vegas Golden Knights along with Erik Karlsson. If Ryan can get his game up to the next level on the top line, that will be good news for Ottawa in a potential attempt to move his hefty contract—which has four years remaining at $7.25 million per year—without retaining too much salary. 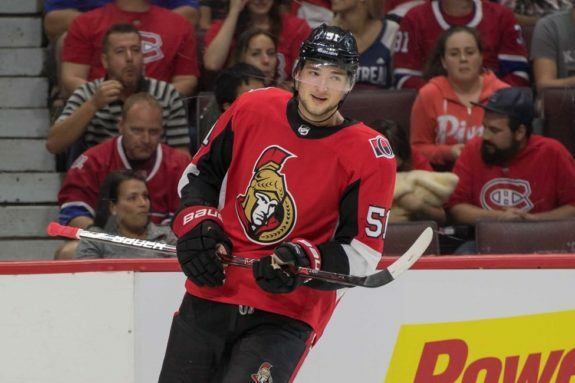 Christian Wolanin, who played in 10 games with the Senators last season, was sent down to the Belleville Senators in favour of fellow rookie Maxime Lajoie. This preseason saw Lajoie jump over not only Wolanin but also Ben Harpur and Christian Jaros, the latter being the last player cut from the team the day before the NHL regular season opens up. Wolanin had a rough training camp, including mistakes and turnovers that led to him dropping down the depth chart. Still a solid prospect for the Senators, he’ll need to fine-tune his game before he gets another crack at the big club. Lajoie remains in Ottawa, one of seven defensemen on the roster. Harpur was likely the candidate to be sent down before Jaros as he didn’t have a strong preseason, but the club likely didn’t want to send him through waivers and risk another team claiming him. Wolanin and Jaros will be back in the lineup this season as the Sens rebuild and pieces move, but it’s clear that Lajoie has passed them on the depth chart for now. The biggest surprise of the Senators’ offseason is Logan Brown. Not necessarily the fact that he was sent down to Belleville, but that he deserved to be sent down. The 2016 11th overall pick did not have a good camp and showed that he’s not ready for full-time NHL duties. The centre had one assist through the preseason even though he played between Stone and Tkachuk. The 20-year-old has yet to use his 6-foot-6, 220-pound frame to his advantage to make a big impact in games, and it’s been reported that the Senators management is concerned about his work ethic. Not a good sign for your former first-round pick. He’s played well in the OHL up to this point, including 48 points in 32 games last season between the Windsor Spitfires and Kitchener Rangers. 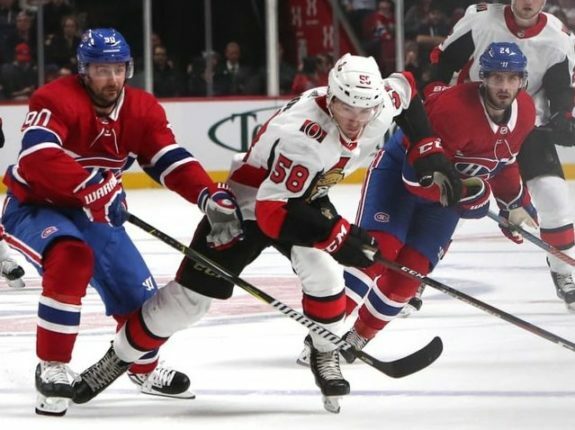 The Senators hope that that offence will transfer to the NHL, but he may need to spend a decent amount of time in the AHL before he’s called up to the team full-time. Brown also surprised at last year’s training camp in that he made the team coming out of it, although he was sent down after the first month of the season, playing in four games and collecting one assist. It was expected that he’d make the team this year, especially after the video from Eugene Melnyk saying to expect “10 of the 22 players to be youth” to start this season. With the Senators expected to make changes through the year as they rebuild, it may not be long before Brown is called up if he does well in Belleville.